Hello everyone. This week has gone by so fast and I can’t believe it’s time for another challenge at Hiding in my Craft Room: “Pumpkin Cobbler Delight”. 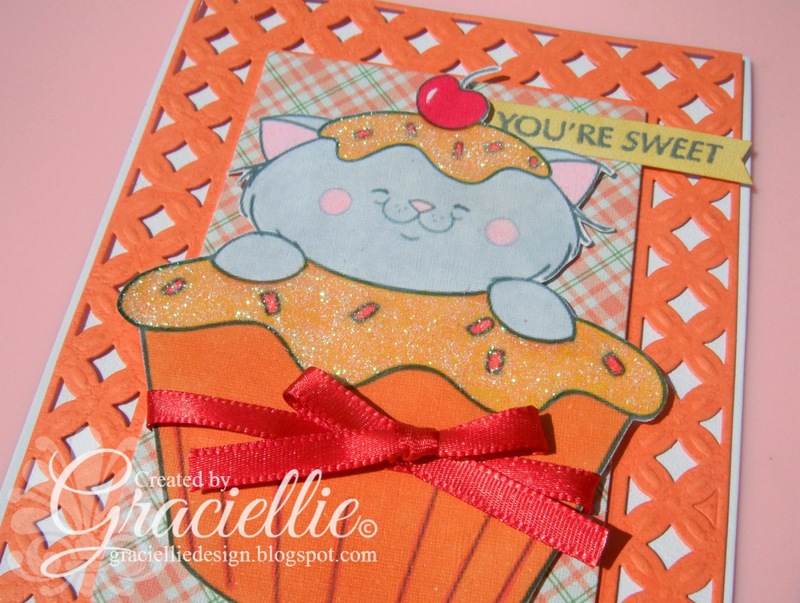 This is a color challenge and we are asked to use Stampin’ Up’s colors: Pumpkin Pie, Cherry Cobbler, and Daffodil Delight. 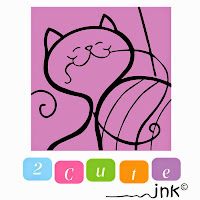 Our sponsor this week is 2 Cute Ink, and oh my are their images cute indeed! 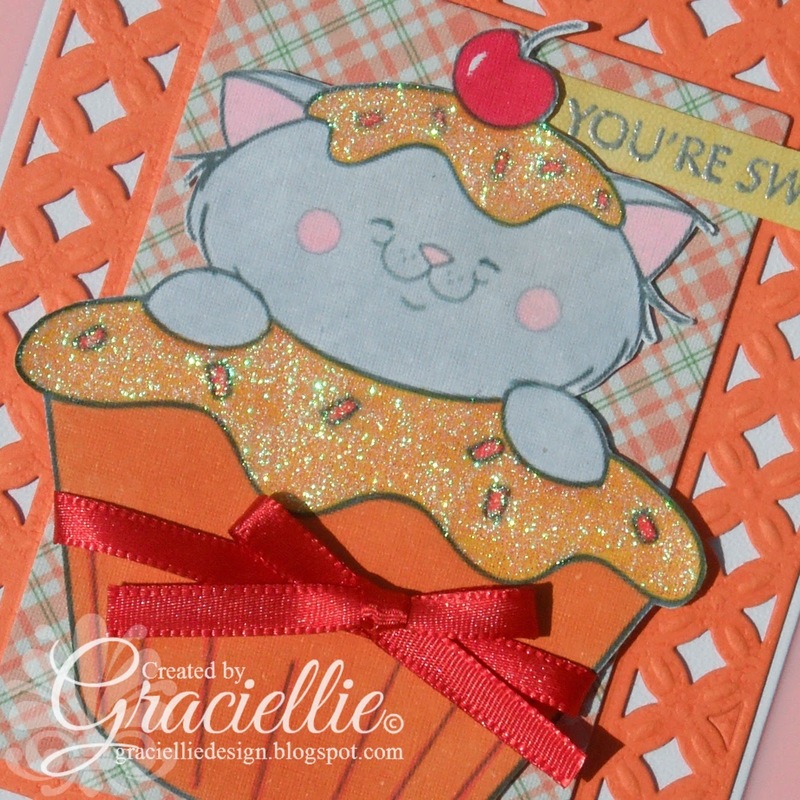 I got to use one of their images called Cupcake Kitty and I loved playing with it. I think it’s perfect for a birthday card but would also work with so many other occassions, especially for a kid. 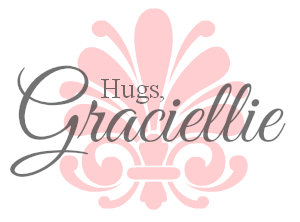 I printed the image on White Pearl Linen which is my preferred textured cardstock for that task. 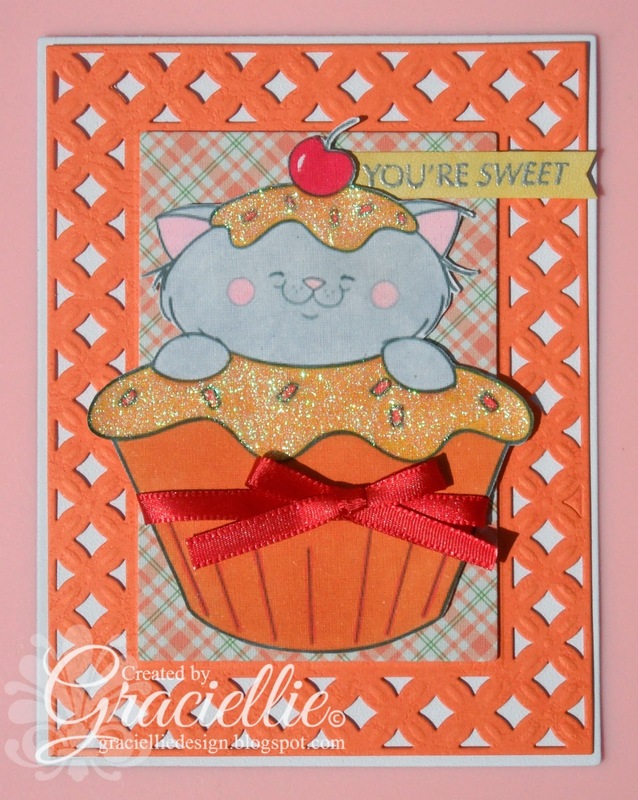 I colored the kitty with Spectrum Noir markers from various sets (Yellows, Reds, Pinks, Essentials) and added some glitter glue to the cupcake frost that I think looks perfect with the fun design. I wrapped a piece of red ribbon around the cupcake, that matches the little cherry, and tied a bow. I mounted the image on a layer of gingham patterned paper from Shery K. Designs and adhered it to an orange base I die cut with Spellbinders’ Diamond Effects which goes along nicely with the rest of the design. Finally I added a little banner with a heat embossed sentiment from Penny Black’s Tweet Tweet set in Silver. I really hope you feel inspired to join us this week! Also remember that the winners of our blog hop have been announced, so you better hop along again and check if you won one or more of the great prizes given away (click here). Really cute! Well done, as always!